The Aqua Lung Group is committed to providing robust, reliable and high performance equipment to all parts of the Professional diving community. Their clear goal is to be the premier “One Stop” provider of professional grade diving equipment to the commercial diving industry. The Aqua Lung Commercial Diving Harness (CDH) is a strength-rated equipment harness (bell jacket style). 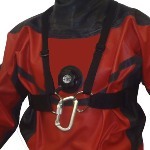 All Aqua Lung harnesses are rated to 2200 lb / 1000 kg breaking strength to meet ADCI, IMCA, CSA and other standards/codes. Atlantic Diving Equipment has been manufacturing the highest quality commercial diving harnesses and weight belts in the United States for over 23 years. Founded by Ray Mathieson, an experienced commercial diver, Atlantic’s growth is the direct result of Ray’s insistence on using only the highest quality U.S. manufactured raw materials. Products supplied by Atlantic meets and exceeds recognized standards of the U.S. Navy and the commercial diving industry. The entire Atlantic Diving Equipment harness range is available from Scuba Center by special order. Contact us for a quote on a harness to fit your needs. Atlantic Diving Equipment products are hand crafted to order at their factory. The expected lead time from the date of order to the date of shipping is approximately 2 to 3 weeks. The Search and Rescue Belt is the perfect complement to any Fire, Rescue or Tactical uniform. Bartacked 1 3/4" webbing provides the perfect combination of strength and flexibility, and fits in regular belt loops. The steel parachute quality hardware features a black powder coated finish for durability. The V-ring tie-in point is secured with a velcro fastener until you need it. One size fits up to 52" waist. Originally designed for ski patrol and mountain rescue use, this “one size fits all” radio harness will instantly adjust to hold any radio snugly to your chest without the use of multiple straps or buckles found on lesser quality harnesses. The vertical orientation of the radio improves reception, extends antenna life, and reduces the chance of chest injury during a fall. Unique suspension system virtually guarantees that your harness will not bounce or swing. Harness features all Cordura construction, a large bellows cargo pocket, pen pouch, and twin elastic antenna keepers. A must for SAR and MCI applications. Storage Pocket: 7.5"x 5"x 2"
Harnesses for use in tethered water operations. Not intended for climbing or lifting!